Gods of Love (2018. 308 pages) is a fantasy novel from Nicola Mostyn. As the book concerns itself with mythological Greek gods being real, the PR sheet tries to connect it with Neal Gaiman’s American Gods, a lofty comparison and one which the book cannot live up to. The story has more than a little kinship with Kevin Smith’s Dogma (1999). 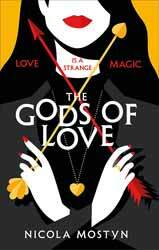 Both Frida and Bethany have lost faith, the former in love, the latter in god. Both are decedents of gods, although neither know this at the beginning of the stories and both go on journeys to stop a great evil, although, thankfully for Frida its not with Jay and Silent Bob. She has Dan and a lot of the book concerns itself with their growing relationship. The story is told from Frida’s point of view and as a character she is portrayed as resourceful and strong. It’s important that she is an empathetic character as she doesn’t really interact with that many other characters. This is not a criticism, as Frida spends much of the book in hiding and we only meet the characters required to further the plot. This is also, I think, a deliberate choice by the author, as it limits the amount of mythology and mythological creatures that you must get your head around. The plot is linear with few twists and a great deal of the enjoyment rests on you liking Frida, which I did. So, it offers nothing world shattering different, but the characters are drawn well, and the pace will keep you interested. There is a gentle wit throughout the book which works in the stories favour.